Rinse the spinach and put into a saucepan with only the water that clings to the leaves. Cook for about 2 minutes until tender. Drain and set aside. Make the cheese sauce: melt the butter in a saucepan, add the flour and cook, stirring, for 1 minute. Remove from the heat and gradually blend in the milk. Bring to a boil, stirring constantly until the mixture thickens. Simmer for 2-3 minutes. Stir in the Cheddar cheese, cayenne pepper, nutmeg, and salt and pepper to taste. Keep warm. In a bowl, combine the spinach with the scallions, cream, and salt and pepper to taste. Set aside. Poach the eggs: add the vinegar to a large pan of boiling water. Lower the heat so that the water is simmering and slide in the eggs, one at a time. Swirl the water around the eggs to make neat shapes. Lift out with a slotted spoon. Divide the spinach and spring onion mixture among 4 warmed flameproof dishes. 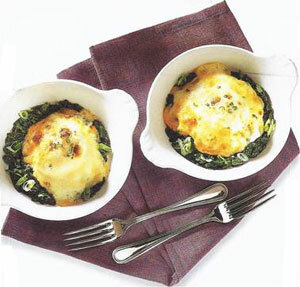 Arrange the poached eggs on the spinach and spoon the cheese sauce over the eggs. Sprinkle the grated Parmesan cheese over the sauce, then place the dishes under the broiler, 3 in (7 cm) from the heat, until the cheese has melted and is lightly browned and the whole dish is heated through. Serve hot.